Russia claimed two gold medals on day two of the European Youth Olympic Festival in Vorarlberg and Liechtenstein as Sofia Tikhonova came out on top in the girls' HS 66 ski jumping event and Sergei Demichev won the boys' biathlon 7.5 kilometres sprint. Tikhonova scored a total of 227 points at the Montafon Nordic in Tschagguns to edge out a trio of Germans, second-placed Henriette Kraus on 221.4 and joint third-placed Agnes Reisch and Luisa Görlich on 219.6. "I am very happy," said Tikhonova. "The weather conditions were not too good - I had tailwind. "But the jumping hill is in perfect shape. "It's a great result; already the training jumps have been perfect. "I will not party much now, I have to focus on the team competition." A time of 24min 45.10sec saw Demichev take gold in Bürserberg, finishing ahead of Sweden's Sebastian Samuelsson in 24:49.60 and Russia's Igor Malinovskll in 24:58.50. Elsewhere, co-hosting nation Austria added a second gold medal to their tally thanks to Anna-Maria Schreder's triumph in the girls' biathlon 6km sprint, held at the same venue as the boys' event. Schreder registered a time 21:31.00, beating compatriot Tamara Steiner by 12.4 seconds and France's Emilie Bulle by a further 7.8. "It was a perfect race," said Schreder. "It's incredible that I have won the gold medal. "Now, I also have a good chance in the pursuit." In the boys' HS 108 ski jumping event, staged at the Montafon Nordic alongside the girls' HS 66, Finland's Niko Kytoesaho, the youngest athlete in the competition, took away the gold medal with 271.3 points. Slovenia's Domen Prevc and Poland's Dawid Jarzabek scored 244.3 and 242.9 respectively to secure their place on the podium, and earn their respective country's first medal of the Festival. 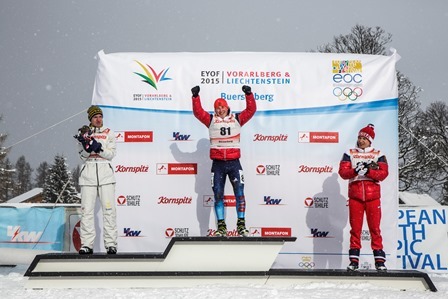 "I knew that I could make it on the podium if I jumped well," said Kytoesaho. "I had two good jumps and that was enough. "Since the beginning of this season, this competition has been my highlight and my set up has really been great. "With this gold medal I have realised my dream. "I hope that we can also win a medal in the team competition." 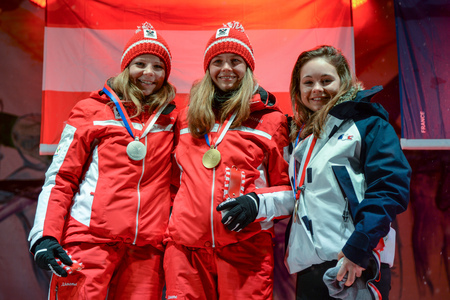 The girls' Alpine skiing slalom event in Malbun, Liechtenstein saw Leona Popovic get Croatia's medal tally off the mark with a gold. Despite a below-par first run, Popovic posted a winning time of 1:33.67, with Austria's Katharina Gallhuber coming second in 1:34.20 and Switzerland's Aline Danioth finishing third in 1:34.45. "I was really disappointed after the first run - I had made too many mistakes," said Popovic. "I absolutely wanted to win a medal here. "In the second run I risked my neck, and it worked out." There were also two more matches played in the ice hockey competition as Switzerland beat Slovakia 2-1 and Russia cruised to a 5-0 win against Austria. After two days of action, Austria lead the medal table with two golds, three silvers and one bronze, followed by Germany with two golds, one silver and five bronze, and Russia with two golds, one silver and two bronze. The EYOF is due to continue tomorrow with biathlon, ice hockey, figure skating, cross-country skiing, Nordic combined and Alpine skiing all featuring on the programme.